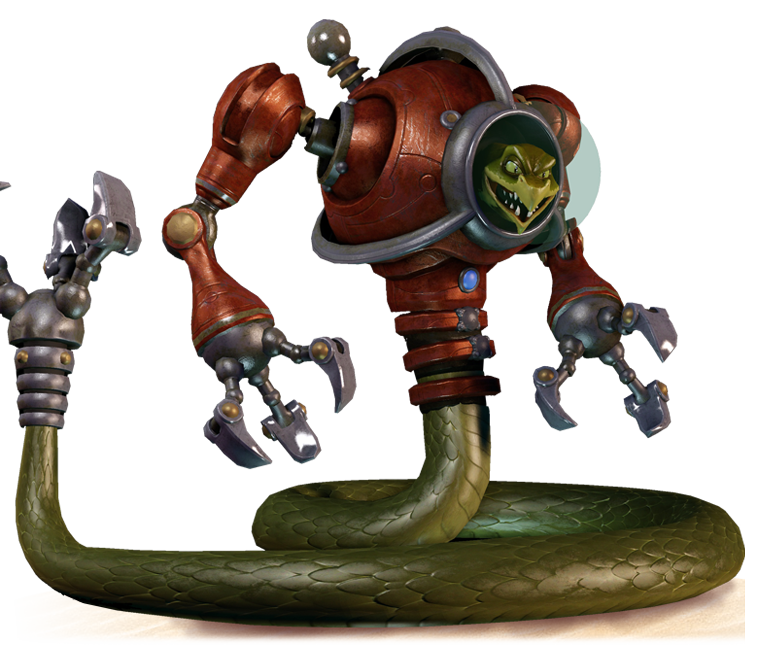 As seen in the Nintendo 3DS and Wii U games, Lyric is the last of his kind from an ancient civilization who lived a millennium ago. His race was devoted to peacefully controlling the world’s resources. Driven mad by power, Lyric turned on his fellow Ancients and took control of the resources. Building an army of robots programmed to obey his every command, the deadly snake-like villain set out to destroy everything organic and create a world of twisted metal and robots. However, just before he could successfully take over, he was attacked by the last surviving Ancients and imprisoned forever. With his army shut down and his plans ruined, he waited in prison plotting his revenge. Years passed and Lyric began to give up hope. That is, until Sonic comes across him. Now with his army rebooted, and his plans in place, the only thing stopping Lyric from total victory is Sonic and his friends. © Copyright Big Red Button Entertainment 2014. All Rights Reserved. The Sanzaru Games monkey logo is a registered trademark of Sanzaru Games Inc. CARTOON NETWORK and the logo TM & © Cartoon Network. Crytek © 2014 Crytek GmbH. Crytek and CRYENGINE are registered trademarks or trademarks of Crytek GmbH in the USA, Germany and/or other countries. All rights reserved.